RideMore is Riverside Harley’s exciting, new Loyalty Program and Mobile App. 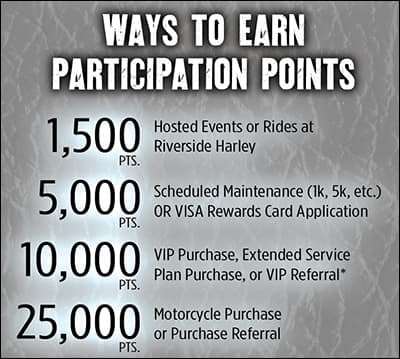 In addition to receiving Reward Points on qualifying Parts, MotorClothes and Service Purchases, you can also earn Participation Points for Attending Events like Bike Nights, HOG Meetings and Riverside Harley sponsored rides. Your Reward Points and Participation Points combine to give you your Level. The higher Level you achieve, the more Reward Points you receive. Rewards Points can be redeemed for Store Credit so getting more Rewards Points for having a higher overall level is awesome! 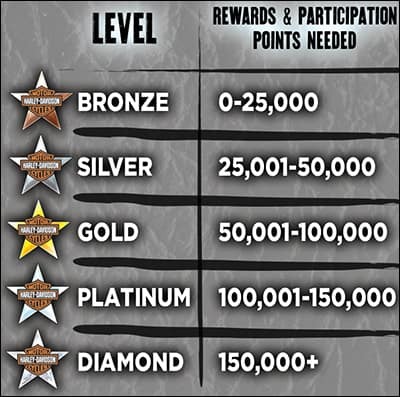 Participation Points are only used to level up, they cannot be redeemed for store credit. Once you hit a level, retain your level for 12 months! Receive Reward Points, based on your level, on Qualifying Parts, MotorClothes, and Service Purchases. Redeem Reward Points for Store Credit. Spend all Rewards Points by February 28, 2019. 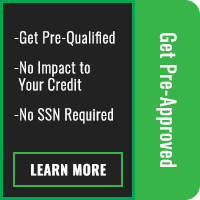 Earn Participation Points for Attending Events, certain types of referrals and more! Everyone starts in the RideMore Program at Bronze and you level up to Silver once you hit 25,001 points. While you’re on Bronze, you get 10 points for every $1 spent so you might go, oh — I have to spend over $2,500 to get to Silver? (Silver gets 15 points for every $1 spent by the way) Unlike other programs — you could jump to Silver or an even higher level without spending a dime! Attend qualifying Riverside Harley events such as Bike Nights and get 1,500 Participation Points with absolutely no purchase necessary. 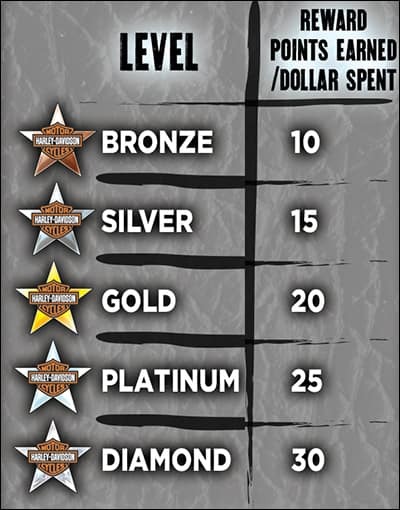 There will be tons of ways to earn Participation Points this year so it’s possible to level up all year long without spending anything; but when you do make purchases, the higher your level, the more Reward Points you will get for every $1 spent that you can then redeem towards Store Credit! Not a complete list! There will be a ton of opportunities to earn Participation Points this year! The best part about the RideMore Program? It’s totally free! To activate your RideMore account, visit Riverside Harley-Davidson anytime during regular business hours and we’ll get you ready to rock! How do I redeem my Rewards? Once you hit 2,500 Rewards Points you can redeem rewards off a future purchase. To redeem your rewards, login to your account on the Web App and print your Rewards Vouchers or show your Rewards Vouchers to the cashier at check-out on your mobile device from the Web App. If you’ve already activated your RideMore account in person at Riverside Harley, you can access your RideMore account to track your points or redeem rewards online or via our Mobile App. The first time you login to the Website or Mobile App you will need your Access Number / Customer ID. If you received a brochure at activation, we may have written that ID# down for you on the white space provided. If you’ve lost the number, e-mail us at ridemore@riversideharley.com and we’ll get you hooked up. Program available at Riverside Harley-Davidson. 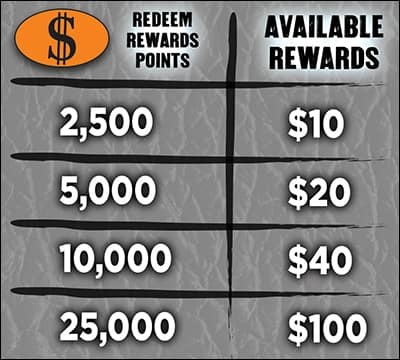 Reward and Participation Points are not awarded for tax or purchases of gift cards and are subject to change. 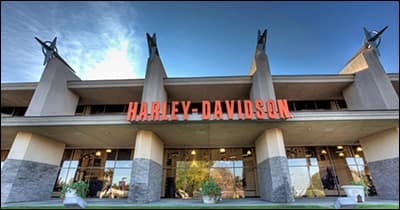 Member benefits are subject to change at the sole discretion of Riverside Harley-Davidson. Please refer to dealer for details.